This is the second of a series of articles that I am writing for Business Insider on bank transparency—pulling information from the detailed financial reports submitted every quarter to the U.S. Federal Government by every operating bank in the United States. 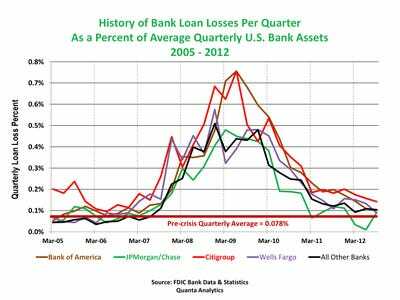 The first article of this series identified the typical financial conditions that resulted in bank closings by the FDIC and then showed how those same conditions have tracked for the entire banking industry throughout the entire period of our most recent financial crisis. In today’s article I will present a view of the Income side of the banking industry—prior to and throughout our recent banking crisis, which by the way, is just now finally returning to a more steady state level of business similar to pre-crisis levels. In doing so, I will provide the reader information that will enable income comparisons to be made between the following four banks: (1) Bank of America, (2) JPMorgan/Chase; (3) Citigroup, (4) Wells Fargo, and the rest of the U.S. banking industry. Multiply that difference between the crisis and pre-crisis levels of Step 2 times the average crisis level of asset times the number of quarters of the crisis. Exhibit 1 provides a good example of how to use this approach to evaluate the most significant of the banking crisis income statement categories—Loan Loss Provisions, the income statement category that the banks use to write off loan losses. Besides many other things Exhibit 1 offers the neophyte a good look at what a typical housing banking crisis looks like throughout the crisis lifespan. Here are some of the more important things to recognise. After the crisis, there will develop a steady state mode of operation that can also be used for benchmarking to get ready for the next banking crisis that the regulators will fail to see coming. Exhibit 1 could have been plotted in terms of loans loss provisions to “loan assets” in lieu of “total assets”. The magnitude of the curves would have plotted differently, offering additional insight relating to bank loan performance; however, in order to be consistent throughout this particular income set of analysis, it was more appropriate to use the same parameter (total assets) for every income statement line item. In this particular analysis I used the eleven-quarter period (03/31/2005 to 09/30/2007) to establish my benchmark measurements for the pre-crisis period. Why that period? Well first of all, eleven quarters of data were sufficient to establish a steady state benchmark—using more quarters would not have changed the results. And secondly, by the quarter ending 12/31/2007 (three quarters prior to TARP) the banks and the regulators should have known a problem was brewing because two major operational benchmarks (non-performing assets and real estate owned properties) had already doubled from steady state levels and the provisions for loan losses as shown in Exhibit 1 had already nearly quadrupled. What I believe is important to understand is that essentially the area below each line in Exhibit 1 and above the steady state level (shown as the horizontal line 0.78%) from the period from 12/31/2007 onward represents bank losses above and beyond those of the prior pre-crisis period. Exhibit 2 shows the results for each of the Big Four Banks and the rest of the U.S. Banking community using this same approach for the major income/expense categories on the standard banking income statement. One example—Loan Loss Provisions for Bank of America–should suffice to explain the above table. 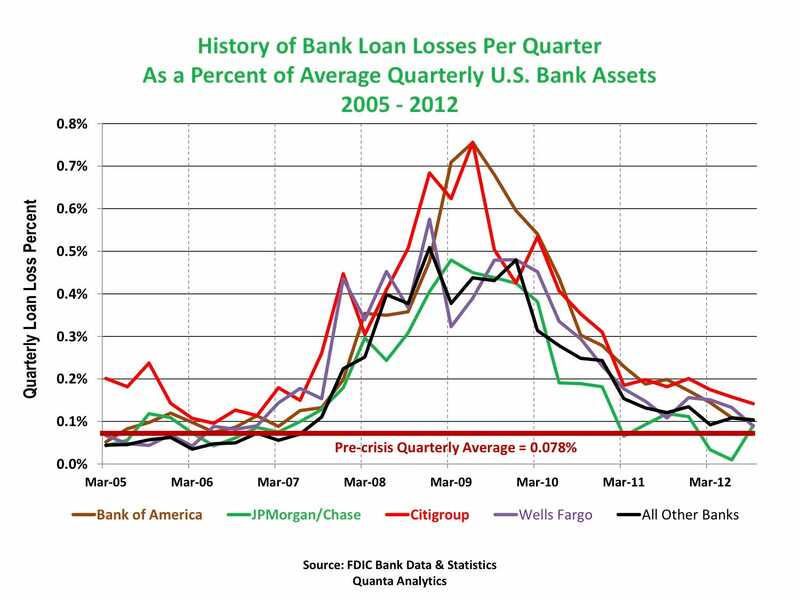 From the data plotted in Exhibit 1, the difference in Bank of America’s “Average Quarterly” Loan Loss Provisions between pre-crisis ($0.0986 per $100 of Assets) and crisis period ($0.3630 per $100 of Assets) is $0.2644 per $100 of Assets. 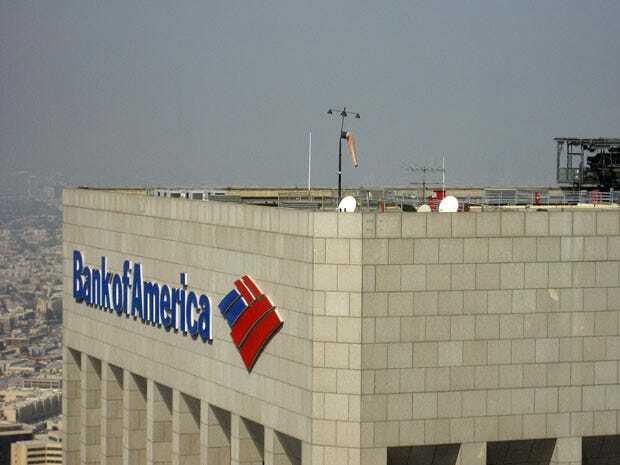 Over the 20-quarter crisis period, Bank of America had on average $1.715 Trillion in Assets—thus the calculation -$0.2644 times ($1,715,000,000,000/100) times 20 quarters = $90.7 billion. Interesting—isn’t it? I will leave it to the reader to decipher most of the above table on his or her own; however, a few things are worth pointing out. 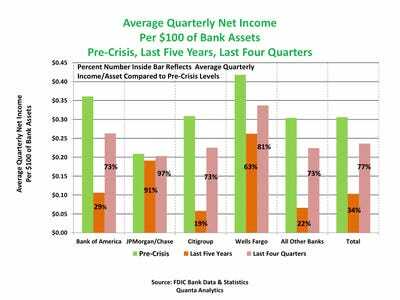 Total bank losses above those that would have been expected from pre-crisis benchmark levels are $551.4 billion—measured over the 20-quarter (five-year) period since 12/31/2007. Over the period of the crisis, the banks paid $264 billion less in income taxes than they would have at pre-crisis levels—somewhat reducing the impact of their overall losses. Losses associated with gains (losses) associated with Securities—minimal. One thing that may not be clear from the above table is that the banks “did not actually lose money” during the crisis. But isn’t that a contradiction from what you have just been showing us, Jim? Not really. You must remember, what I have presented is the difference between what the banks made during the last five-year crisis period compared to what they would have made if they would have continued to make money at the rate they did prior to the crisis. Exhibit 3 may provide you a better way to view the real impact on the Big Four banks and the rest of the U.S. banking community. 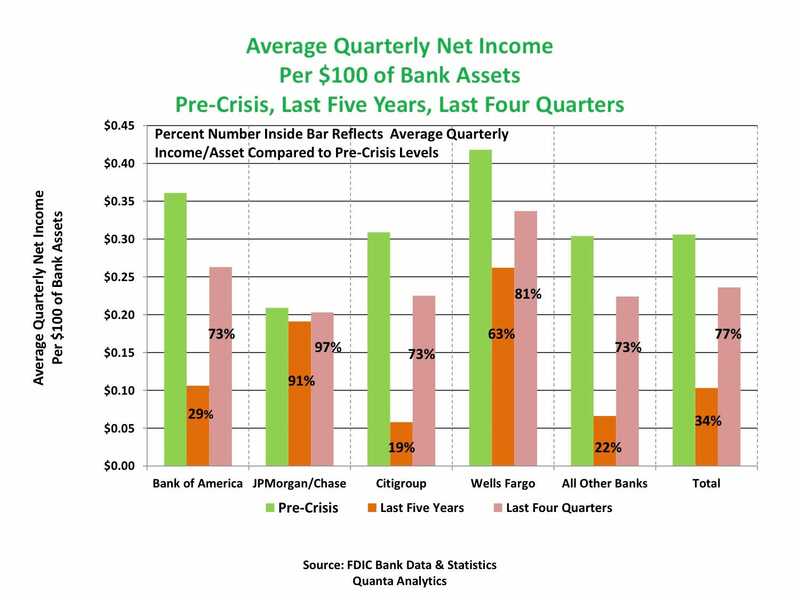 Exhibit 3 shows the overall quarterly income to asset level as reported by each of the Big Four banks and for the rest of the U.S. banking community for (1) the eleven-quarter pre-crisis period; (2) the five-year crisis period; and (3) the last four quarters of our crisis. I believe the Exhibit speaks for itself and will point out only that the percentage figures shown on the Last Five-Year and Last Four-Quarter bars are in relation to the Pre-Crisis bar for each of the entities shown. Note that in no case in the above graph did the income/asset ratio become negative. Now I would like to end by saying this. It is very difficult to cover up mistakes within regularly reported and standardly-accepted financial data over an extended period of time—especially from “quants” and regulators that know what to look for. And in today’s world the problem with identifying crises before they happen is not generally due to a lack of data, but with those people in charge who do not know what to look for. Well, that is it for today’s discussion relating to bank transparency. Next week, depending upon feedback, I intend to dig deeper into my income analysis, otherwise I may turn my attention more towards how the different bank balance sheet asset categories have changed between the pre-crisis and post-crisis periods. That, too, is an interesting subject on its own.